Romhacks can offer ingenious ways to replay or remix games. They can also offer crude, clunky, and unfortunate design choices to change a game forever. Today, we're looking at the latter. These are games which every Nintendo fan is familiar with, but for one reason or another has been remixed to add or change features that quite possibly no one has asked for. What is it: A small modification that changes the season to Autumn, makes the dog do the moon walk, and includes an 8-bit rendition of Michael Jackson's moon walk. Review: I'll admit, I'm impressed that the dog does the moonwalk, even if it's really just his animation sprite in reverse. The change to autumn is really comfy and I'd love to see a winter version as well. This makes me think we should do a Romhack that adds rain to further complicate and obscure the ducks. Of course we're all wondering how the moon walk music sounds in game and I decided to save us all time and upload this video. What is it: This modification replaces Japan with China, includes a new logo to represent the 2002 World Cup, and of course changes all the players into rabbits. What is it: In this hack, the roles of Thomas and Sylvia have been reversed! Sylvia must now save her boyfriend, Thomas, from the evil Mr. X. What is it: Changes the outlaws to undead characters and alters the backgrounds. Review: Completely unnecessary and offers no gameplay changes, but I'll be damned if this isn't actually a pretty cool twist on the western envionment. We jokingly compared Wild Gunman to Red Dead Redemption on the podcast, but now we can also compare it to the DLC expansion pack, Undead Nightmare! 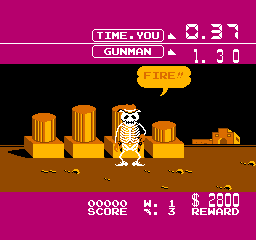 I'm going to give this one the thumbs up if only for the polished skeleton sprites. What is it: The FBI has decided to change its training facility to prepare for the upcoming invasion of the Mushroom Kingdom. The gangsters are now Bowser and D.K. Review: Honestly, this is pretty cool. Major props to the art on this one. 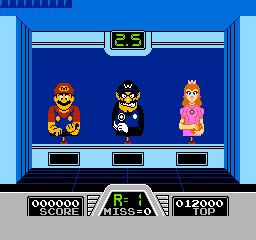 The Mario that replaces the Cop looks as much like the Cop as he does Mario. It's really strange to see Bowser and Donkey Kong holding guns, if only because both Super Mario Bros. and Donkey Kong would be incredibly tough if those dudes just weaponized. What is it: Tee up for 18 holes, but this time you play as the band members of KISS! Review: Of course this one had to be saved to last. What a bizarre creation we have here. 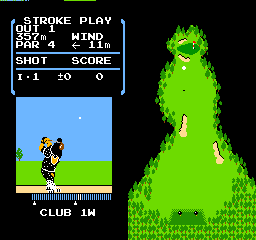 Beautiful and accurate sprite work of KISS meets the classic 18 holes of NES Golf. So if you happen to be a huge fan of GOLF specifically on the NES and also a huge fan of KISS, today is a pretty big day for you. The question I'm going to leave here is, why? Are KISS known for being into Golf? I know Alice Cooper is actually a big Golfer and it probably would've made more sense to make Golf - Welcome to My Nightmare than to include KISS. But I think it's really nice that this exists.